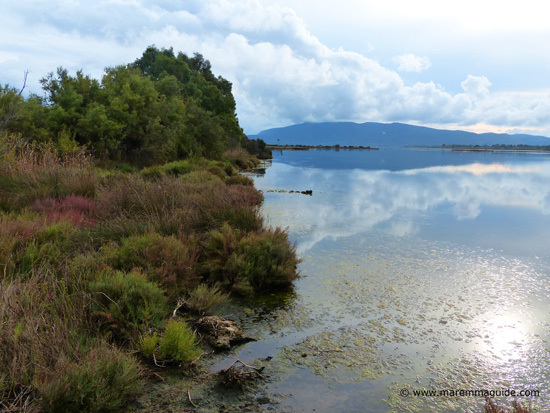 The Riserva Naturale della Laguna di Orbetello might be a serious birder's paradise, but you don't have to have done any birdwatching in your life before to spend a great couple of hours there. There are so many to see - close-up, as well as in the distance - including the striking pink flamingoes for which the lagoon has become synonymous, and such a variety, that a couple of hours will pass before you know it. 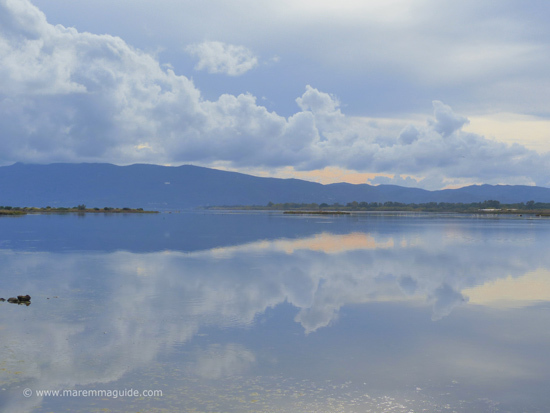 Better known as simply the Laguna di Orbetello, this thousand hectare World Wildlife Fund site is home to the very special 300 hectare saltwater Orbetello lagoon; a designated Ramsar Wetland and the largest wetland on the Tyrrhenian coast. It is not surprising, therefore, that this is a favourite location for some serious bird watchers and photographers alike. But don't let that put you off for fear of "trespassing" in hobbyists playground, for this protected wildlife reserve in Maremma is just as good at pleasing professionals as it is in providing a great morning or afternoon out for families and school trips. Note: The video is only 6.46 minutes long and you will need to wait until 4.14 minutes to see the little things with feet! but to watch it all is to understand: not only what is going on, but the pace of life here in Maremma. 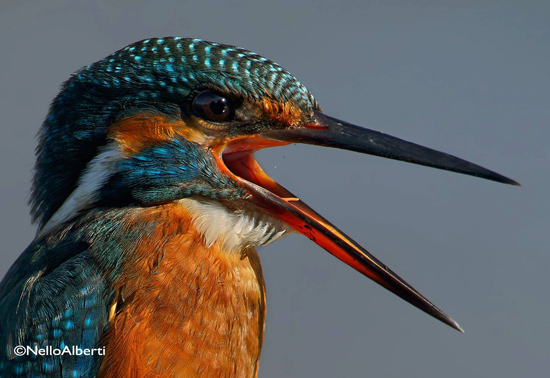 A female Martin Pescatore - Kingfisher - in Orbetello Laguna by kind permission of Nello Alberti. Flamingoes on Orberello Lagoon in January. 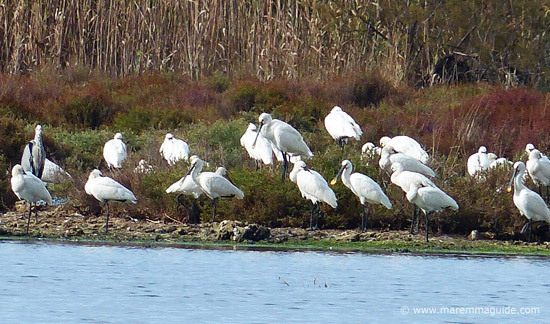 There are 257 different species of birds that, at one time or another, make their home in Orbetello lagoon. 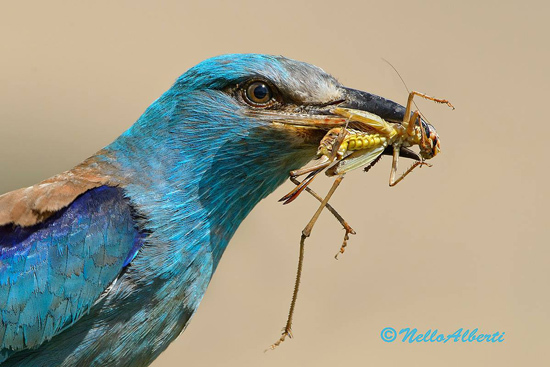 The rarer species include the Osprey (Pandion haliaetus), the European Roller, (Coracias garrulua), the Great Spotted Cuckoo (Clamator glandarius), and Montagu's Harrier (Circus pygargus). 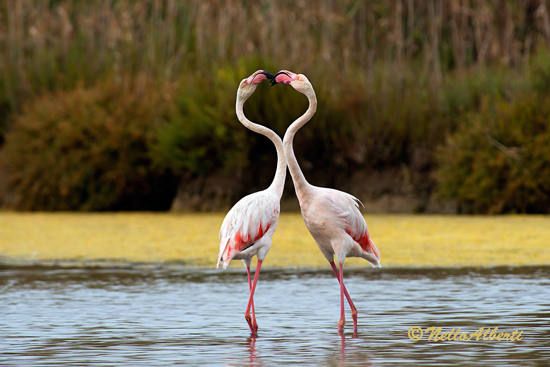 The best time to visit for birdwatching is in the autumn and winter when there are the greatest concentrations of aquatic birds: over 4,000 Pink Flamingos, 200 Spoonbills, more than 400 Avocets, as well as ducks, waders, raptors. Although you can see many birds close-up from within the hides - the two courting Fennicotteri rosa (Pink Falmingoes) in the photograph above were very close to one when Nello took this shot - you will need a pair of binoculars to get the best out of a visit to the Laguna. But take note that there aren't any available on loan from the WWF office. The best time to see the wild ducks and geese in the reserve is in the autumn and winter. It is also the time that the males sport their most impressive plumage before the more somber feathers of the spring. You'll be able to spot the Oca selvatica (Anser anser) - Greylag Goose, Germano reale (Anas platyrhynchos) - Mallard, Alzavola (Anas crecca) - Eurasian Teal, the dabbling duck Marzaiola (Anas querquedula) - Garganey, Codone (Anas acuta) - Northern Pintail, Mestolone (Anas clypeata) - Northern Shoveler, Fischione (Anas penelope) - Eurasian Wigeon, Canapiglia (Anas strepera) - Gadwall, Volpoca (Tadorna tadorna) - Common Shelduck, Edredone (Somateria mollissima) - Common Eider, Moretta (Aythya fuligola) - Tufted Duck, Moretta grigia (Aythya marila) - Greater Scaup, the diving Fudge or Ferruginous Duck, Moretta tabaccata (Aythya nyroca), Moriglione (Aythya ferina) - Common Pochard, and the Fistione turco (Netta rufina) - Red-crested Pochard. The migratory wading birds are present in the lagoon during the spring and autumn. NOTE: The Grey heron can be found also during the winter, and the Little Bittern which nests amongst the reeds, during the summer. 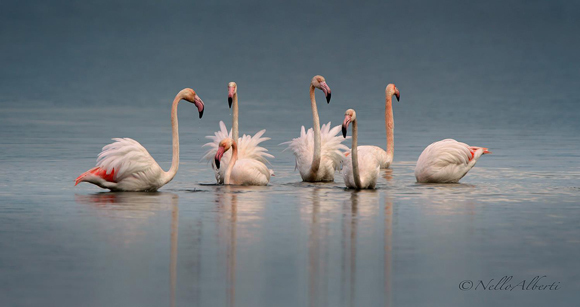 The best time to observe the stunning "Fenicottero rosa" - the pink Flamingoes is in the winter when the resident flock is joined by large numbers of birds from the French park at Camargue, at the mouth of the river Rhone. It is then that their number swell to over four thousand birds. But the lagoon is also home to these splendid waders: the Airone rosso (Ardea purpurea) - Purple Heron, Airone cenerino (Ardea cinerea) - Grey Heron, Airone bianco maggiore (Ardea alba) - Great Egret, Cormorano (Phalacrocorax carbo) - Great Cormorant, Gru (Grus grus) - Common Crane, Garzetta (Egretta garzetta) - Little Egret, Spatola bianca (Platalea leucorodia) - the Eurasian Spoonbill, the Tarabusino (Ixobrychus minutus) - Little Bittern, Nitticora (Nycticorax nycticorax) - Black-crowned Night Heron, the tufted Sgarza ciuffetto (Ardeola ralloides) - Sgarza ciuffetto, Ibis mignattaio (Plegadis falcinellus) - Glossy Ibis, and the Cicogna (Ciconiidae) - Stork. An amateur tip from a real amateur - me! This is going to sound really obvious and so I hesitate to add it here, but I didn't put the two together and, as a consequence, missed a great photo opportunity which I don't want you to. So forgive me if this sounds dumb. If you hear the sound of a low flying aircraft or some machinery starting-up on the land on the opposite banks of the lagoon from the hides where there are some private houses, then get your camera focused on the closest flock of flamingoes that you can see. Because they will, more likely than not, take flight. When we were there I heard a noise, but hadn't thought about the likely consequences and missed photographing them take off and in flight. By the time I had gotten my camera on and in focus they had gone! My husband told me after the event that it was a sure done deal that they would :( And I should have remembered from our boat trip in the Riserva Diaccia Botrona when a low-flying plane came over head and the same thing happened. Apparently flamingoes are nervous birds. Without a doubt, the best attraction as far as my husband is concerned - he is a keen fisherman - was the sight of some very large "Spigoli" (Seabass) splashing in and out of the water - very close to one particular hide - amongst a shoal of smaller, most probably "latterini" fish, and swallowing them! They were noisy what's its too! We had to stay in that hide for quite some time and returned to watch them again! The laguna is home to Orata (Sparus auratus) - Gilt-head Bream, Spigola (Dicebtrarchus labrax) - European Seabass, Muggine or Vefalo (Mugil cephalus) - Flathead Mullet, Gambusia (Gambusia affinis) - Mosquitofish, Sogliole - Sole, Ghiozzi (Gobiidae) - Goby, Latterino (Atherina boyeri) - Big-scale Sand Smelt, Anguilla (Anguilla anguilla) - European eel, Nono (Aphanius fasciatus) - Mediterranean killifish, Sarago (Diplodus sargus sargus) - Sargo, Carpa (Cyprinus carpio) - Common Carp, Tinca (Tinca tinca) - Tench, and il Luccio (Esox lucius) Northern Pike. 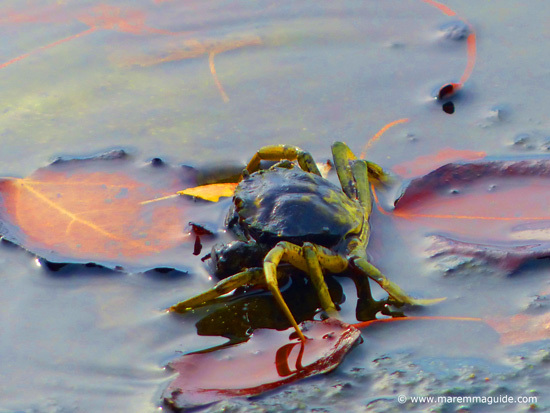 I loved the much quieter crabs in the shallow waters next to the hides. The damsel and dragonfly species here include the White-legged Damselfly (Platycnemis sp. ), the Broad-bodied Chaser (Libellula depressa), the Large Red Damselfly (Pyrrhosoma nymphula), and the Southern Hawker (Aeschina cyanea). 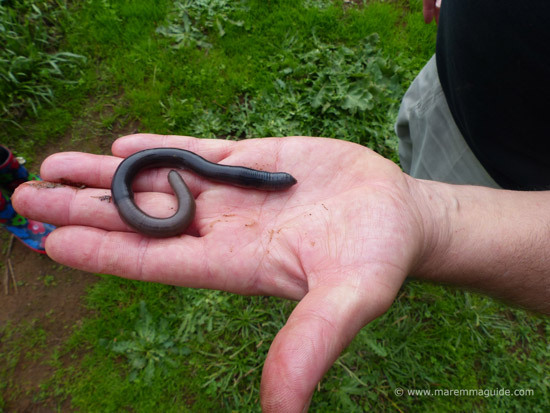 Keep your eyes out along the path and you'll also spot some big fat worms! (A lot less tricky to photograph!) This is a bird sanctuary after all! TIP Take mosquito repellent with you just in case. We only got bothered by a few to be honest - but they were big ones! - and were so engaged in watching the birds and fish we didn't care too much. Resident reptiles include the Green Whip Snake, the Vipera, the Slow Worm, the Water Snake, the rare Four-lined Snake, and the Water Turtle. 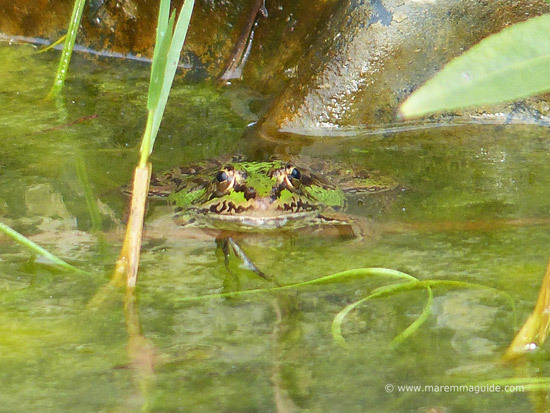 Although having once been on the at risk list, you can now see frogs, tree frogs, toads, and Triturus newts in the ponds and pools of the lagoon. Foxes, badgers, porcupines, martens, weasels, deer and wild boar all hunt and live in the reserve. 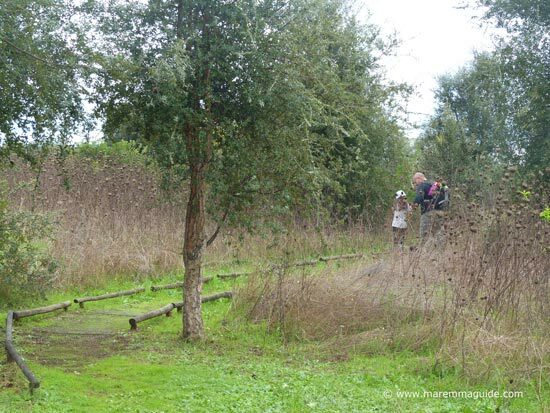 There is a small botanical garden adjacent to the ticket office that you will walk through a corner of to reach the start of the footpath trail through the reserve. 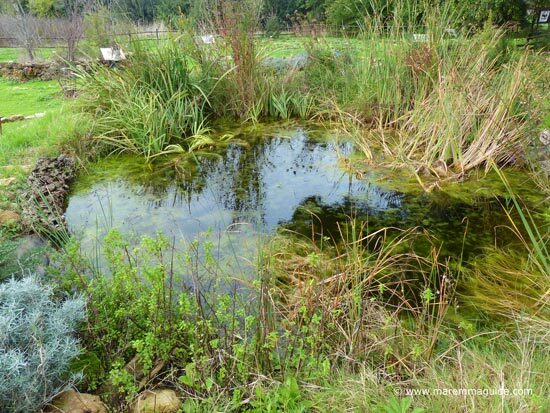 And although you probably won't want to stop on your way to the lagoon, on your way back if only smell the aromatic perfumes of the many herbs growing in it ... and to spot these gorgeous guys in the pond. 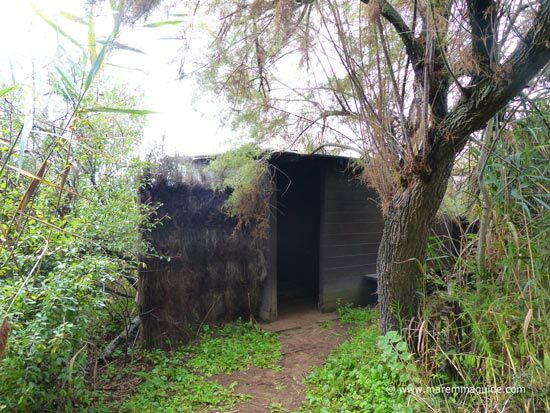 The Laguna di Orbetello WWF oasis also includes the 42 hectare pine and cork Bosco di Patanella (Patanella Wood) along the banks of the lagoon (with more observation huts), and the educational and schools centre, Casale Giannella, with it's butterfly garden. The Bosco di Patanella happens to be the most southern heath in Europe, and is home in the spring to many wonderful wild orchids, including, in the wet meadows, the rare Marsh Orchid (Dactylorhiza). The ornithological footpath around the Riserva Naturale della Laguna di Orbetello - the one that we took - is open from 1 September to 30 April each year, on Saturdays, Sundays and Bank Holidays from 09:30 to 15:00. It is possible for schools and groups to visit during other days of the year by reservation. The Bosco di Patanella site is open every day of the year from 09:30 to sunset. NOTES: If your group consists of ten people or more, access is only permitted to the woods accompanied by accompanied by a WWF guide. 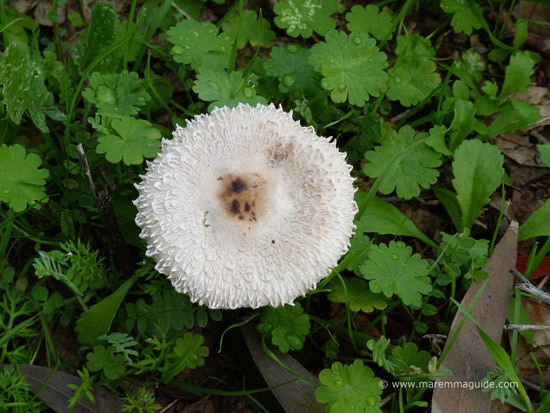 And, with prior permission, you can go mushroom hunting there between 1 September and 31 December. Birdwatching and supper in one trip: what else do you need?! The entrance fees are €5,00 for adults, €3,00 for children aged between 6 and 14 years, over 65's, and groups of a minimum of 15 people. Entrance is free for members of the World Wildlife Fund, and children under 6 years of age. Guided tours are an extra €3,00 for everybody, not withstanding age etc. There is no charge for entry to the Bosco di Patanella. The circular footpath to the lagoon and the hides is wide, flat and really easy going. Easily accessible by wheelchair, as are seven of the nine hides along the route. The other two - which includes the first - are tower hides with narrow wooden steps. There is a sign along the SS 1 Aurelia road as you head south past the town of Albinia and a second at the exit to the private road, but they are on pretty discretely coloured backgrounds and almost camouflaged against the roadside! - it is a wildlife sanctuary after all I guess! If you weren't looking for them, you could very easily miss them altogether. Heading south along Maremma's coast, the simplest direction instructions is to keep on the Aurelia road past Albinia and at the 148 km sign, take the exit onto a private single-track road. The road ends at the entrance, car park and ticket office for the reserve. The Bosco di Patanella exit is at the 149 km sign, signposted for the village of Patanella. The WWF office is a tiny room in an out-building. There is one toilet in the equally tiny room next door. The WWF don't sell water or food, so you will need to take what you might need with you. There is a handy picnic seating area right next to the car park. 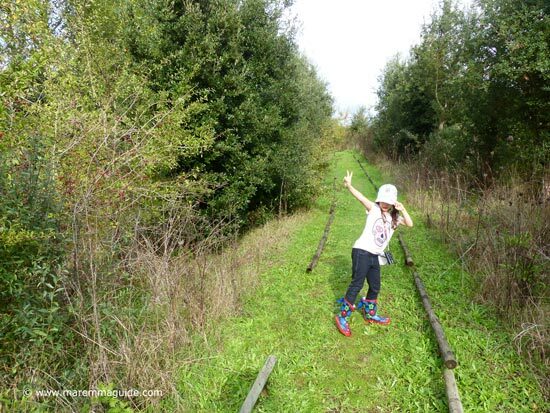 If you are wondering whether a visit to this wildlife reserve will go down like a bomb with your older children - there aren't any "activities" - my daughter's verdict was that she "loved it!". If one lagoon in a day isn't enough, then the Lago di Burano - Burano lake - another WWF oasis site, is only another 20 kilometres further south from the Riserva Naturale della Laguna di Orbetello.